Directions: It is located on Taman Rekreasi Raja Lumu and can be accessed by either Persiaran Kayangan or Persiaran Sultan. Because of its sheer size and tall minarets, one can see the building even from the Federal Highway. Info / Insights: With four tall minarets and a huge blue and silver aluminium dome, the Sultan Salahuddin Abdul Aziz Shah Mosque is one of the most distinctive landmarks in Shah Alam, if not Selangor. It is the second largest mosque in South-East Asia, after Masjid Istiqlal in Jakarta, Indonesia. 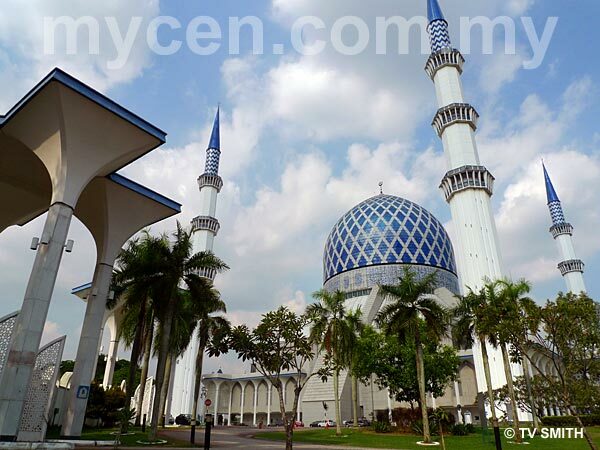 Also popularly known as the Shah Alam Blue Mosque, its grounds cover some 14 hectares of beautifully landscaped park. The architecture incorporates Malay and Islamic elements and intricate calligraphy by famous Egyptian calligrapher Shiekh Abdel Moneim Mohamed Ali El Sharkawi. Opened on 11th March 1988, the majestic mosque can accommodate 24,000 worshipers. The mosque is draped in a wi-fi cloud for the convenience of visitors.